If you have any questions or want to enquire about dates, use our form to contact Cristina Gaggero. 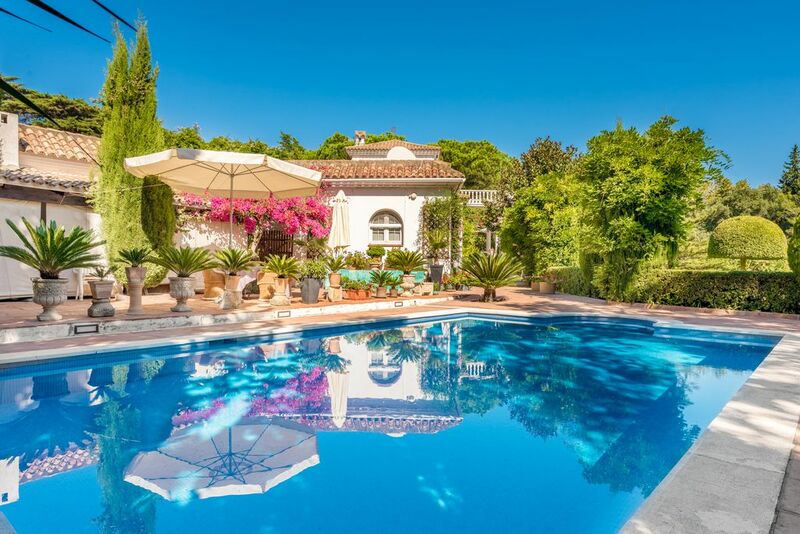 A sophisticated, elegant B&B in the middle of Sotogrande, the largest privately owned residential development in Andalusia and home to an eclectic, international community. Your hostess, Cristina, can organise a guest pass for entry to a private beach club, or you can take day trips to nearby Tarifa and Marbella or the stunning sierras. Just off the coastal motorway you’re buzzed in via the intercom and sweep up the drive to the sprawling white villa, with its series of rooms set around a Moorish-style courtyard with a fountain. All rooms have direct access to the garden; the suite is a huge, striking room with traditional furniture juxtaposed with modern art. It has a large sofa, fireplace, white marble bathroom and French windows onto your own terrace, overlooking the garden. A uniformed maid serves breakfast and light suppers in the fabulous dining room; Cristina, a long-term resident of southern Spain, may well be able to help you with plans for the day and advice on restaurants, history and culture. You’re welcome to use the pool with its sun deck and gardens but there’s much to explore further afield, although you will need a car. Pets by arrangement. Minimum stay 3 nights. In-house spa treatments available. Lunch & dinner available on request. Restaurants 3-minute drive. Overfloor extra double room (en suite) available on request. Fabulous 5 night stay at Villa Safira. Sunshine in abundance, delicious breakfasts and a wonderful hostess, Cristina. We were given an incredibly useful tour of the area on day 1 which set us up for our stay - fabulous 5* beach clubs with moroccan themed interiors, wonderful pools and sea views. So much to do in the area. Lovely evening meals at harbour restaurants. The villa's room is very spacious... beautiful gardens and a pool. Enjoyed the beaches in Tarifa too. Zafira is the epitome of elegant and sophisticated Andalusian living. A large extremely comfortable bedroom with its own sunny patio where breakfast can be served by the ever-attentive live-in maid, Felly. Who would ever want to stay in a soul-less hotel when you can have access to a home from home like this. Thank you, Kristina, we will be back....soon! Sotogrande is not far away from Jerez de la Frontera where you can visit the Sherry Vineyard or the Osborne Bodegas. Sevilla is 2-hours away, worthy to visit for a day-trip and enjoy the wonderful Catedral, Torre del Oro, Plaza de España or the typical Barrio de Triana. Tarifa - Bolonia: Enjoy a fantastic day on the beach! Wind surfers Paradise! Beautiful golden sand. Long level beaches to walk kilometers. Good restaurants or beach bars. In Tarifa you can visit the historical Castle with views across the straits to MORROCCAN coastline. Feels you can touch the mountains! Or rent the boat for 2-3 hours with a group of friends to watch the SUNSET. TAKE some TAPAS AND A GOOD BOTTLE OF WINE and you have it all!